Runner types- the New Haven Road Race folks sent me an email survey, the gist of which was asking if they should ‘add’ a half marathon option to the Labor Day 20k. The 20k is a great race as is, period, full stop. I was kind of upset when they trebeled the size of the crowd showing up Labor Day morning with the 5K; however, in hindsight, it works as an option to get the whole family running. Which is awesome, and adds to the great atmosphere. However, adding a half marathon would be a huge mistake, because you wouldn’t really add runners, rather just shift folks from the 20K field. Any new runners who came to the event to the event would be the dumb ones who can’t think metric and realize that 20k is only a half mile shy of a half marathon. The folks who care deeply about labels, and are just looking to check a distance box instead of running for the sake of running and reveling in the last day of summer. The types who won’t do a triathlon unless it’s got an M-Dot. From here on, we’re going to call the proposed half marathon the 21K. And I encourage you to drink beer. Not every event needs to be the same. There’s value in having some odd distances, in that it captures the essence of racing, which is “Hey, I bet I can get THERE faster than you”. Tarzan Brown should be to the top of River Road and back, construction dependent, and shouldn’t get truncated to a 5 mile race. Adding another 0.2502 miles would make the Manchester Road Race just another 5 miler instead of an almost 80 year Thanksgiving Tradition. Probably would start at 10 AM instead of “10:00 a.m. Sharp”. These traditions are what unite us in our local “tribes”, what give us opportunities to actually talk instead of just nodding while we pound out miles day to day to day. New Haven on Labor Day should be a 20k followed with beer on the green, and then pizza and more beer in the park. While I’m pretty convinced just based on tradition, being a stick in the mud, and getting into my mid-40s, I’m skeptical of the logistics of running a 21K alongside “The” 20K. I’ve run several marathons where there was a half marathon run on the same course, and where the races split has always been a giant bag of poop for mid-pack runners, regardless of which distance they’re running. Either the half runners miss the turn and get a slower half time, or the marathoners accidentally make the time and end up running 26.4 instead of 26.2. And that’s where there’s a HUGE difference between the race distances. Part of the reason the 5K and the 20K work alongside each other is because they are “alongside” each other, not on top of each other. The start areas are together, which is cool, and the finish areas are together, which works because even if you’re walking a 5K, you probably are going to finish ahead of the elite runners running the 20K. Anyway, the idea stinks. I’d still run it if the only race was a 21K, just because the weather and green are glorious on Labor Day, and at the end of the summer, a 20K-ish distance is just fun to run, and to revel in a summer’s good training. But the idea of running both a 20K and a 21K doesn’t work for me, though I’d keep running the 20K out of spite, and griping about the split or the finish or something, which then spoils a great summer day. I didn’t run the Hartford Marathon. Training was going great through the New Haven Road Race – mileage was adding up easy, weight was coming off, life was good. Then, the summer ended, opportunities in the form of a couple of new job opportunities arose, obligations with social commitments grew, and training just kind of fell by the wayside. Not enough to where I couldn’t have gutted it out and ran another 4:30 marathon. But enough to where I really didn’t want to devote an entire day to another mediocre marathon. So I bailed. Just flat out didn’t show up. I regretted not getting to see Dianna and my buddy Doug run, and regretted not getting the sweetest beer in the world in the tent at the end of a long race. But, I got to move tables with my Cub Scout pack. Got to enjoy a fall day with my lovely bride. And a last (and first for this year) dinner at Abbott’s for the year. And y’know what? In hindsight, I’m glad I bailed. 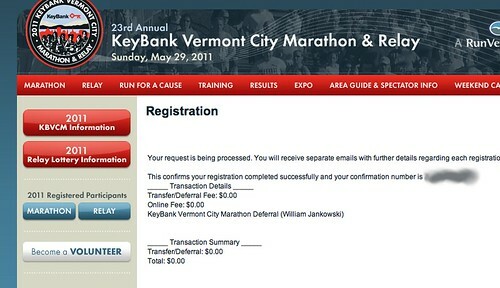 Not sure if I’m going to register for another marathon for a while. I may train for a few smaller ones that I could run if training goes well, but for the time being, I’ve decided that there’s enough in my life. Running and biking is part of that; committing to a giant race doesn’t have to be. Went to see the doctor yesterday – acute case of PF, no fracture or whatever. Official ruling is no running until June. Which means that I’m Cycle, Cycle, Cycle, Swim, Swim, too until then. I don’t think it’s a coincidence that space stalled in the ’80s. Our national psyche changed in the ’70s and ’80s. First we centered on the individual – self worth regardless of the approval of the community. Then we decided that “greed is good”, and made selfishness a virtue. Even religious conservatives have, rather than “denying your father and following Me”, that everything centers on an individual’s family, regardless of the rest of the community. In the two decades after that, we decided that even a non-binding responsibility of the individual to think of the good of the community was equivalent to Soviet communism. No more pledging “our lives, our fortunes, and our sacred honor” to everyone else in the country – what a bunch of hippies must have written that. I’ll get mine, thank you very much. We need to get back to thinking that we can do great things as a society for the benefit of all mankind.